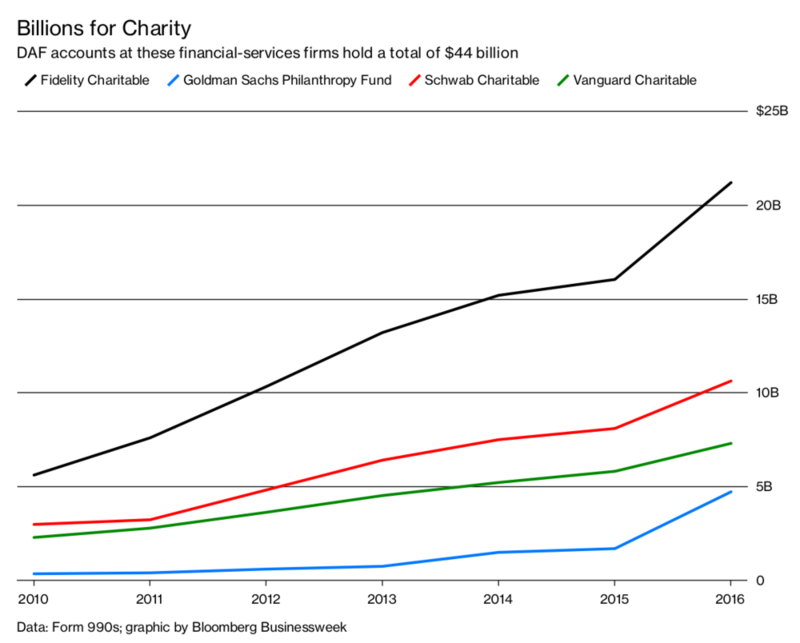 Many thanks to Suzanne Woolley of Bloomberg for her article “Super Rich are Stockpiling Wealth in Black Box Charities“. It has always been my humble opinion that donors can do whatever they like with their money – it’s their money. I would contend it is my job as a fundraiser or philanthropic catalyst to connect a donors’ passion to a person or program that inspires their generosity. While I have not been around as long as donor advised funds (DAF) (1930) but I was 10 years into my fundraising career when in 1991 Fidelity won a landmark ruling from the IRS that recognized its fund as a public charity. In case you didn’t follow, the ruling, it allows donors to take an immediate tax advantage, so deposits can be timed to maximize savings. Donors can then parcel the money out to charities at their leisure — when and if they so choose, privately. While the fund continues to earn money in these accounts. Today Fidelity is among the largest of “funds” in corporate and community foundations offering this tax vehicle to US donors. That donor poll that says, “The last reason a donor gives is for a tax advantage.” Yeah well DAFs are the exception to that rule. The DAF allows for an immediate charitable tax deduction. We can blame the 1991 IRS (and George HW Bush) ruling for allowing Fidelity to open this door and create this monster pile of money. A conflict of interest started immediately – Fidelity and their clan of investment houses earn money on all the money in those DAFs. Remember “too big to fail” – this is the philanthropic version. You already have a lot of high network individuals (HNWI) and their family’s money. Why not capture more? AND help them earn more so you too can earn money on their money? AND you have just become the messiah of their money management – avoidance of capital gains, taxes and more. AND you could double or triple the money under management and earn for the investment house and your bonus. AND you know nothing, really, about charitable giving, and couldn’t care less. AND what could possibly be your incentive to counsel, encourage, extol your HNWI clients to make charitable contributions which would lower the dollars under investment? Those are big ethical questions. Fidelity leadership, IRS and Bush #1 administration had no issue with any of this. And that my friends is how we got to where we are today – philanthropically speaking. Entry filed under: Fundraising, Nonprofit fundraising, Nonprofit Research. Tags: DAFs, HNWI, Philanthropic Fracking, philanthropy, working with donors and their donor advised funds.